What would you give up to play for your country in the World Cup? Jacob Oram would give up his finger to play. Jacob Oram is willing to cut off his injured ring finger if it is going to prevent him from playing in the World Cup. Oram will try specially designed splints and pain-killers to ease the pain, but if the problem won’t go away he will consider an amputation. “If it means cutting the finger off, if that’s the worse-case scenario, if that’s the last resort, I’ll do that, there’s no way I’m missing this,” he told NZPA. Oram suffered the break during the first Chappell-Hadlee Trophy match and he will not test it until the New Zealand squad’s first practice session in Barbados on Saturday. Good on him, I think. And if he plays, he gives New Zealand the extra depth they need to make a serious tilt at the Cup. Tim May has criticised the ICC regarding the sheer number of matches countries are expected to play, highlighting the ridiculous schedule facing Australia and India later this year. The two sides will face each other 21 times in 8 months, but their packed intinerary is just the peak of the mountain. We’ve known this would happen for years yet the ICC continue to pile on the matches and honour the boards’ and TV companies’ greed, at the players’ and spectactors’ expense. “They were already playing each other 18 times and now they’ve thrown in another three (in Ireland),” May said. “We’re concerned about that. Players have a passion for the game and want to maintain that passion every time they play. But it’s becoming harder to play every game as though it’s their last. “No one wants a two-bit product where blokes are only giving 75 percent because that’s all they’ve got left. Or because they need to pace themselves for more games coming up.” May, who has criticised the heavy workload on players in the past as well, also took a shot at the upcoming World Cup, arguing that it dragged on purely because of TV broadcasters. “Our World Cup is too long,” he said. “Everybody bar the people who sell the TV rights believe we could compress it. The ICC sells the rights for significant amounts of money and obviously the broadcasters want to get their money’s worth. One-day cricket is the commercial world’s gem. Short, fast, glamorous, colourful, loud, they are a huge revenue-generator for TV companies and the ICC. But with excess comes complacency, comes boredom. Do the players really want to be playing this amount of cricket? Of course not. Do the public care enough to sit through a seven-match humdrumathon after witnessing a Test series which, with the exception of India, remains the game’s pinnacle of entertainment? I doubt it. One-dayers should be the icing on a series’ cake, not a whole extra extravagant meal in itself. One-day cricket is a victim of its own success, its shelf-life coming to an end. If nothing is done to address the sheer quantity of matches being played, we could well see strike action from the players in a desperate attempt not only to remain fit, but mentally sane. I hope so, too, because the ICC are far too one-eyed to see sense unless a problem smacks them in the chops. Patrick Kidd has his own thoughts over at Line and Length. Offer yours below. 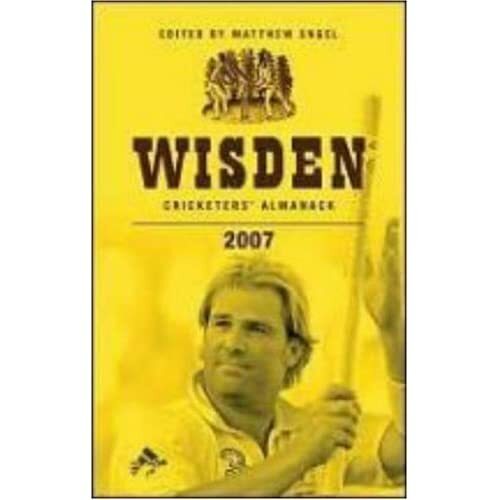 Perhaps unsurprisingly, Shane Warne is on the front cover of next month’s Wisden Cricketers’ Almanack. Available in two flavours, hardback and paperback . No word on whether they are publishing the excellent larger edition which made its debut last year. A very positive review from Bruce Talbot of Mushtaq ‘Mushy’ Ahmed’s book, Twenty20 Vision: My Life and Inspiration. Mushtaq was re-born as a person and eventually as a cricketer, although Sussex supporters will be disappointed that only six pages – the smallest chapter in the book – are devoted to his amazing success with the county since 2003. His outstanding county career is strangely ignored in a statistical appendix that does not do justice to his record and it is a shame that the publisher’s budget did not stretch to a wider selection of photographs. But these are minor gripes. Mushtaq has written that rarity among current players – an honest appraisal of his life so far. Sussex supporters in particular will hope there are a few more chapters left to tell. Buy it for a smidgen over a tenner. An unbelievable catch by Shane Bond in his follow-through. He is a bit special. See here if you can’t view it above. This came through yesterday: an Indian designer (or nutjob) has made a car in the shape of a cricket bat. The five-wheeled car runs on a 135cc engine and weighs 300 kgs has a top speed of 60 kmph. The pretty innovative wacky automobile designer Kanyaboyina Sudhakar has been designing cars from the age of 14. Sudhakar who holds the Guinness Book of World Record for the largest (41.7 feet) tricycle has dedicated his latest creation to the Indian cricket team, soon to leave for the Caribbean for the World Cup. Click here if you can’t see the madness above. A brilliant video from Nike, India’s sponsors, ahead of the World Cup. Click here if you can’t see it above. It is official that Brett Lee won’t be going to the 2007 World Cup, and it will be Stuart Clark that replaces him. For all Clark’s obvious abilities at Test level, there’s no doubt who is the more dangerous bowler with the white ball, and this is another blow to the Australians. Despite all their troubles, Australia are still favourites with the British bookies. Some of these prices are remarkable, to be honest. South Africa at 9/2 look a bargain to me. I can’t help but enjoy Australia’s slip from grace. I’m British and it’s my absolute right. Most of all though it’s the Australian media which really gets me going. Australia only need lose once and immediately, without prejudice or loyalty, their champion side is reduced to a bunch of complete losers. When they enter a losing streak, as they have in the past two weeks, the headlines make hilarious reading: “hapless,” “demoralised,” “licking wounds,” “Australia agony”. It goes on and is completely, brilliantly merciless. Until they win, and they’ll once again be hailed as the greatest sporting side in the history of the planet. I’m probably completely wrong, but the turncoat style of Australia’s papers is in some ways a microcosm of a society which simply cannot accept losing. Ever. In any form, at anything. And this isn’t to say the criticism isn’t valid – Australia have been shoddy, no mistake. It’s just the tabloid turnaround which just astounds me…there is never any balance or reasoned debate as to their fall from grace. “BLOODY LOSERS. SACK THEM ALL” you half expect a headline to read. I met two great Aussies on safari last week, Shelley and Paul. Both in their thirties, travelled all over the world, they were eager to hear my thoughts of Australia. “Been to Aus then Will?” And I told them I had. Before I could finish Shelley said “Yeah great isn’t it? Awww the beaches, everything’s just great isn’t it? Don’t you think?” And it is, and I love the country. But disliking Australia was not an option! Not all Aussies are like this but the positive, must-win vibe runs through the country like a critical artery. Cut it, and there’s blood everywhere. Losing is just not an option and losers should be shamed. Britain is completely, emphatically the opposite. We love to shame the losers too, but we also love to love the losers and the underdogs. Whereas in Australia, a crap league side would be backed to the hilt with a genuine belief their fortunes would turn around, in England we actually enjoy the struggle! Of course we don’t want England to lose, but we just shrug our shoulders, tut, throw a dart at Ricky Ponting and move on. C’est la vie.